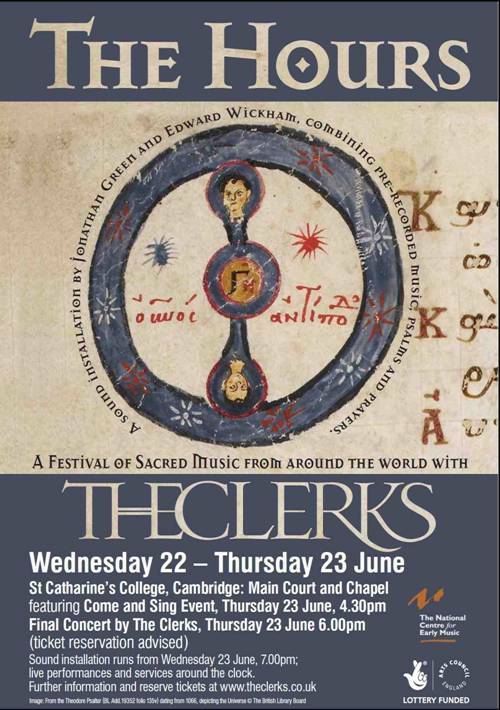 The Hours is a 24-hour collage of sound and live performance devised by Jonathan Green and Edward Wickham, in association with award-winning vocal ensemble The Clerks. The Hours celebrates the impulse to pray and to praise; an impulse shared by the faithful of all the world religions, and one which has inspired the finest art, literature and music. Drawing on the universal poetry of the Psalms, The Hours presents multifarious sounds, voices and music in a tapestry which is at times abstract, and at times intensely direct and human. The sound installation provides the backdrop for live performances by Cambridge-based groups; including a ‘Come and Sing’ event open to singers of all ages, ability and experience. In the final hour, the diverse elements of the collage coalesce into a live performance featuring Taverner’s sumptuous Missa Gloria tibi Trinitas, whose dense, polyphonic lines have previously been heard fragmentarily. • The Hours sound installation will run continuously in Main Court throughout the 24 hours. featuring the World Premiere of a new work melding Western and Middle Eastern chant by Jonathan Green. Everyone is welcome, whatever your previous singing experience to add your voice to the rich and inspiring harmonies. Admission to all aspects of The Hours is free. you can also simply join in on the day. Tickets for the final performance (limited) can be reserved by contacting music@caths.cam.ac.uk. The Gregorian Chant Course concluded with a memorable final Workshop on Saturday last at St John’s Cathedral, Portsmouth. The day followed a similar format to the previous 7 Workshops with participants dividing into 2 groups under the direction of Abbot Cuthbert Brogan OSB and Christopher Hodkinson. The participants prepared the chant for Mass of the Vigil of Pentecost which was celebrated by Abbot Cuthbert and sung to a very high standard. At the beginning of the day everyone was given a Final Questionnaire, which was a follow-up to the Questionnaire issued at the first Workshop. For those who have participated in the Course and were unable to attend the final Workshop, but who would like to comment, I enclose a copy of the Final Questionnaire. Once completed, please return it to me as soon as you can. The Workshop concluded with a discussion forum which gave an opportunity for questions and answers. Plenty of points were raised which included comments on the Course, ideas for continuing practice of the chant and how to reach a wider and younger audience. There was also a lot of interest in participating in a future course. Finally, gratitude was expressed to Abbot Cuthbert and Christopher for their contributions to making the course such a success; and to the Cathedral Administrator, Canon Hopgood, for allowing us to use St John’s Cathedral and Hall. 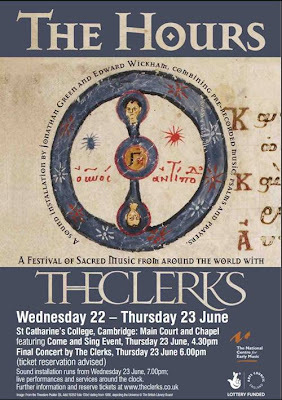 In this half-day workshop, in the oldest church in the City of York, we will learn and sing some of the most beautiful hymns, antiphons & psalms in the repertory of Gregorian Chant. We will immerse ourselves in the history, sound, technique and language of this ancient musical style, working toward an authentic and beautiful performance of Compline [The Night Office] at the end of the day. All materials (scores and helpful resources) are included in the cost of the day. Beginners and more advanced singers are welcome. Registration Fee: £6.50 – £5.00 for Students. It would be helpful if you could register in advance, as this will give us an idea how music & other source materials to prepare! To register please contact us at mike.4b@ntlworld.com or telephone (01904) 341853. There is more on the Vatican Information Service blog; I can't find the letter on the Vatican website yet. It is frustrating not to be able to see the whole letter.